Few samples. Few treated by Mattias Forshage. Very few samples. Mostly large and heavy species that are usually very rare in Malaise traps. Few samples. 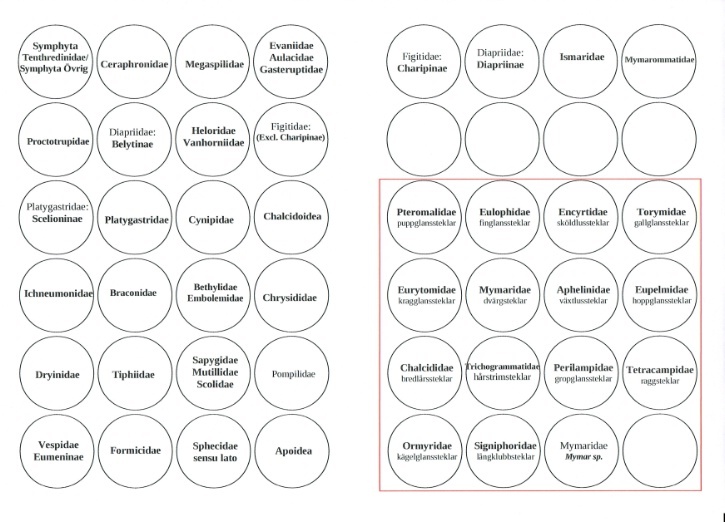 Some identified by Mattias Forshage and Andreas Taeger. No records; a very rare species. No records yet. Mostly large and heavy species that are usually very rare in Malaise traps. Several samples. Sometimes further sorted into two halves. Under treatment by Andreas Taeger et al. Ref Savina et al 2013. Few samples. Under treatment by Andreas Taeger et al. No records yet, a rare species. Very few samples. Identified by Mattias Forshage. Several samples. Many treated in a student project by Joakim Pålsson, some identified by Mattias Forshage. Ref: Pålsson 2012. Several samples. One species new to the country. Some treated by Kees van Achterberg. Several samples. Many treated in a student project by Emilia Mühlhäuser, some identified by Mattias Forshage. Ref: Mühlhäuser 2014, Mühlhäuser 2015. Very few samples. Only one very rare species in the country. Identified by Dave Karlsson. Few or no samples; only as an earlier intermediary stage in sorting. Several samples. All treated or under treatment in a student project by Mareike Kiupel. Ref: Kiupel 2013. Scelioninae Haliday, 1839 (Scelionidae) Äggmärkarsteklar (73)More than a thousand samples. Some under treatment by Ovidiu Popovici. Several samples, though only temporary, an intermediate stage in sorting. No records yet. These wasps are rather rare but more easily caught in "window trap" flight intercept traps. Figitidae Hartig, 1840 Glattsteklar (197)Several samples, though only temporary, an intermediate stage in sorting. Charipinae Dalla Torre & Kieffer, 1910 (47)Hundreds of samples. Few treated by Mattias Forshage. Hundreds of samples. Several new species to the country and to science found in the material. Under treatment by Mattias Forshage and Guilherme Costa Baião. Ref: Baião 2012, 2013, Forshage 2009. "Small figitid subfamilies" (47)Hundreds of samples. Under treatment by Mattias Forshage. Hundreds of samples. Few treated by Mattias Forshage. Hundreds of samples, though only an intermediate stage in sorting. Hundreds of samples; only temporary; an intermediate stage in sorting. Several samples; only temporary; an intermediate stage in sorting. Several samples. Very few treated by Mattias Forshage and Emilian Pricop. Several samples. The single species known from the country was considered rare but the winged males are not uncommon in SMTP samples. Identified by Massimo Olmi and Mattias Forshage. Hundreds of samples. A few species new to the country. Treated or under treatment by Massimo Olmi. Several samples. Many treated by Johan Abenius. Several samples. Many treated by Johan Abenius, and a few by Eckart Stolle. Few samples. Many treated by Johan Abenius. Not yet recorded. Only one rare and very local species known in the country. Several samples. Many treated by Johan Abenius, and a few by Villu Soon. A few samples; usually sorted directly to subfamily level. Hundreds of samples. Many treated by Urban Wahlstedt, some by Libor Dvorak and Bo G Svensson. Not yet recorded. Very rare in the country. Hundreds of samples. Many treated by Johan Abenius, some by Urban Wahlstedt. Hundreds of samples. Some treated by Johan Abenius. Few by Eckart Stolle and Bo G Svensson. More than a thousand samples. Few identified by Bo G Svensson. An earlier fraction. All samples sent to Andreas Taeger et al. Ref: STI Nematine group 2013, Prous et al 2014.